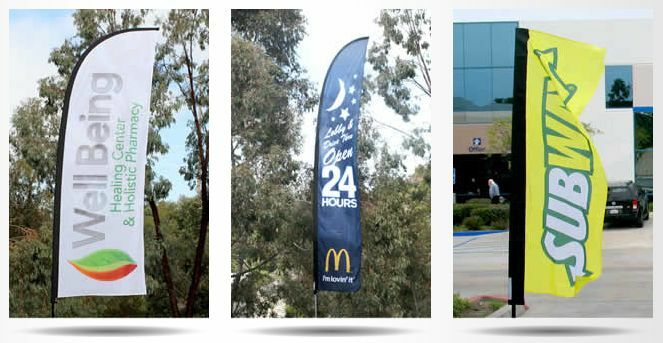 When it comes to outdoor marketing arena, there is no substitute for feather flags. This promotional material is a head-turner in big events, which can drive the attention of the crowd to your promotional stand. In the existing competition of the present market, it is common that the outdoor event venue will be flooded with similar products and services, all trying hard to attract consumers’ attention. In such a situation, which stand do you think, will attract the potential customers? With all its probabilities, the stand in the distance, with its flying feather banners will pull the buyers towards it. To stand out from the crowd, and create a profound visual impact on the visitors, these flags are the most promising solutions in an outdoor event. The secret of making a compelling banner flag is to maintain its size and shape as per the type of event, so that it can accommodate the brand message. For instance, a large size flag can promote your marketing message in a trade show. You can print your call to action using big and clear fonts and graphics, which the passerby can read effortlessly. Designing the graphics for the feather flags, by compiling several layers of jpg images to present them in a printable format is the real challenge of making these flags. For an impeccable output, high-resolution vector graphics are used. You can use Adobe Illustrator and Photoshop to create the original designs. It generates an inviting visual effect, when it waves in the wind, with its fascinating designs. It takes time to create an attention grabbing feather flag. You should always keep a month’s time, excluding the buffer period of at least 15-days to polish up the overall look and feel. In general, creating a perfect vector image to display a product or service in trade show flags takes time. Cost cutting plays an important role in all the activities of marketing and project management. This can be realized by reusing the same flags for more than one time. If you intend to repeat your promotional endeavor, you can use the same trade banners. This means, your company logo, its legal name, and its message, should remain steady. Even, if you decide to change the graphics, still you will save money on the framework of the flag. One of the four ‘Ps’ of marketing, the place, fetches a prolific outcome. As you complete making the trade show flags, chalk out the ideal place to set it, so that it can attract maximum number footfalls. Ideally, you can place it at the fringes of a display area for maximum attention. Flags are one of the unique vehicles to promote your brand message. These feather flags can escalate your brand exposure through continuous visibility in trade shows. These trade flags are made of tough quality fabrics, with UV-resistant inks. Therefore, you can use them under any weather condition.